What is the PRICEMAT Function? 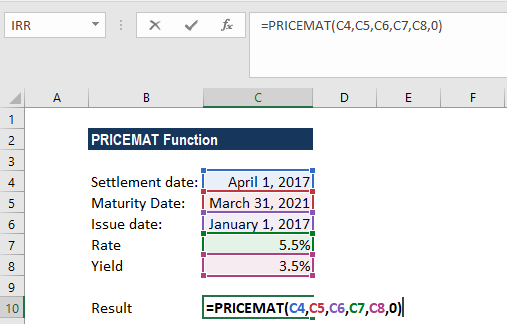 The PRICEMAT Function is categorized under FINANCIAL functionsFunctionsList of the most important Excel functions for financial analysts. This cheat sheet covers 100s of functions that are critical to know as an Excel analyst. It will calculate the price of a bond that pays interest at maturity per $100 face value. In financial analysisAnalysis of Financial StatementsHow to perform Analysis of Financial Statements. This guide will teach you to perform financial statement analysis of the income statement, balance sheet, and cash flow statement including margins, ratios, growth, liquiditiy, leverage, rates of return and profitability. See examples and step-by-step instruction, the PRICEMAT function can be useful when we wish to borrow money by selling bonds instead of stocks. We need to know the minimum figure to charge investors. We can calculate its price per $100 of redemption value using PRICEMAT. Settlement (required argument) – It is the security’s settlement date or the date that the coupon is purchased. The security’s settlement date should be after the issue date. Maturity (required argument) – It is the security’s maturity date or the date when the security expires. Issue (required argument) – It is the security’s issue date that is expressed as a serial date number. Rate (required argument) – It is the interest on the security on the date of issue. Yld (required argument) – It is the annual yield of the security. Basis (optional argument) – It specifies the financial day count basis that is used by the security. 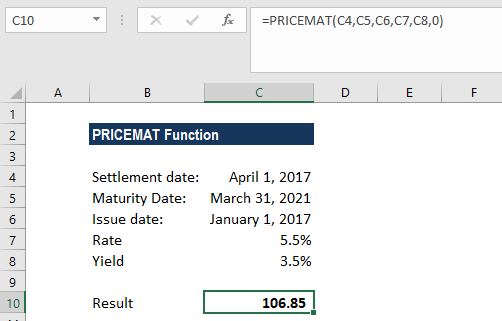 How to use the PRICEMAT Function in Excel? If we wish to calculate the price per $100 face value of a security that pays interest at maturity, we can do it using the PRICEMAT function. The security’s issue date is January 1, 2017, the settlement date is April 1, 2017, and the maturity date is March 31, 2021. The rate of interest at issue is 5.5% and the annual yield is 3.5%. The US (NASD) 30/360 day count basis is used. We provide references to the cells in the formula. As recommended by Microsoft Excel, we provided as input the settlement, maturity and issue dates as references to cells containing dates. The rate and yld arguments are provided as input as percentages (5.5% and 3.5%, respectively). However, the arguments can instead be entered as the simple numerical values 0.055 and 0.035, respectively. If the [basis] argument is omitted, the function will use the default value 0 (denoting the US (NADS) 30/360 day count basis). Here, we provided it as 0. The issue date is greater than or equal to the settlement date. The settlement date is greater than or equal to the maturity date. When we provide invalid numbers for the rate, yield or basis arguments. That is, we provided a rate that is less than zero, yield that is less than zero or basis is a number other than 0,1,2,3,4. The given settlement, maturity or issue arguments are invalid Excel dates. Any of the given arguments are non-numeric. To master the art of Excel, check out CFI’s FREE Excel Crash Course, which teaches you how to become an Excel power user. Learn the most important formulas, functions, and shortcuts to become confident in your financial analysis. Launch CFI’s Free Excel Course now to take your career to the next level and move up the ladder!